Horchata is a Spanish and Latin American beverage traditionally made from ground nuts, seeds, or rice, combined with sugar, spices, and water. In this foraged horchata recipe we’re infusing milk with carob powder to make a carob horchata. There are as many horchata recipes out there as there are horchata makers, which means I didn’t feel too guilty about messing with culinary tradition to create this foraged carob horchata. Some recipes call for milk, others don’t. Some use only rice, some only almonds, others use a combination of both. The amount of sugar varies greatly; I cut it way down, but I’ve listed a range below in case you like your horchata on the sweet side. The sole constant in horchatas seems to be the use of cinnamon as a flavoring. I backed off the cinnamon and vanilla in order to bring the carob flavor to the front. 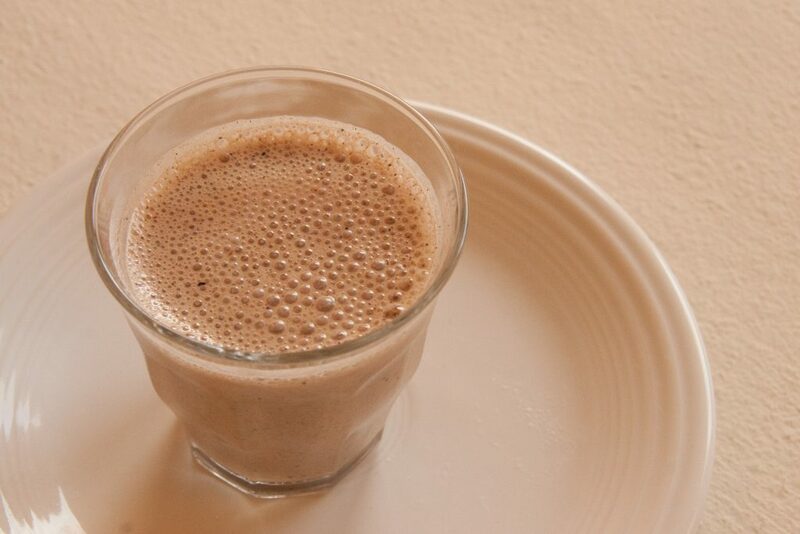 Combine the hot water, rice, cinnamon stick, and carob powder in a blender and pulverize. Let the mixture sit for four to eight hours, then strain the liquid through a jelly bag, squeezing every last drop out of the bag. You’ll get 1 to 1 1/2 cups of liquid. Pour the liquid into a quart jar and add the milk, vanilla, and sugar to taste. Put the lid on the jar and shake well. Horchata will keep in the refrigerator for two to three days, but you can also use it right away. The solids settle out after a few hours, so be sure to stir or shake it up before mixing your cocktail. I struggled with the name for this cocktail before I settled on “Hey Sailor!” Ultimately I was inspired by the idea of travelling to forage for carob (it doesn’t grow where I live), and sailors pulling into foreign ports. Mixing homemade horchata with tawny port and a touch of vodka makes it extra special, and just a little bit boozy. Combine all the ingredients in a shaker full of ice and shake for 30 seconds. Strain your cocktail into a rocks glass.